Ise (伊勢市, Ise-shi), formerly called Ujiyamada (宇治山田), is a city located on the eastern tip of Kii Peninsula, in central Mie Prefecture (formally in Ise Province), on the island of Honshū, Japan, facing Ise Bay. Ise is home to Ise Grand Shrine, the most sacred Shintō shrine in Japan, and is thus a very popular destination for tourists. The city has a long-standing title – Shinto (神都) – that roughly means "The Holy City" and literally means "Capital of the Kami". Most of the city is within the geographic limits of Ise-Shima National Park. As of September 2012, the city has an estimated population of 129,125 and a population density of 619 persons per km². The total area is 208.53 km². Ise's history is directly linked to that of Ise Grand Shrine. Ise Grand Shrine is separated into two main parts: The Inner Shrine and the Outer Shrine. Despite the names, these are actually two physically separate shrines approximately six kilometers apart. Modern Ise began with small settlements that sprung up around the two shrines. During the Edo period, Ise was a popular destination for pilgrimages which were called "o-Ise-mairi" (literally, "Coming to Ise") and thus these settlements grew larger and developed into small villages. The village around the Inner Shrine was named Uji and the village around the Outer Shrine was named Yamada. Because of the religious importance of Ise Grand Shrine, the Tokugawa shogunate during the Edo period viewed the area as politically significant and installed a magistrate in Yamada. During the Meiji period, these two villages were merged and designated as a single municipal entity. The resulting amalgamated name of Ujiyamada represented the merged villages. The name Ujiyamada stood for 66 years and, to people who live in the area, is still synonymous with Ise. Between 1890 and 1930, two train lines were constructed which are known today as the Kintetsu Yamada Line and the JR Sangū Line. These railways connect Ujiyamada to Osaka, Nagoya, and the rest of Japan and were responsible for a large increase in pilgrims and tourists visiting Ise Grand Shrine. The renaming phase took some time around the city. For example, it took four years to rename the main JR station in town, Yamada Station, to Iseshi Station. Some things were never renamed such as Ujiyamada Station, Ise's largest train station, and Ujiyamada High School, Ise's first high school. 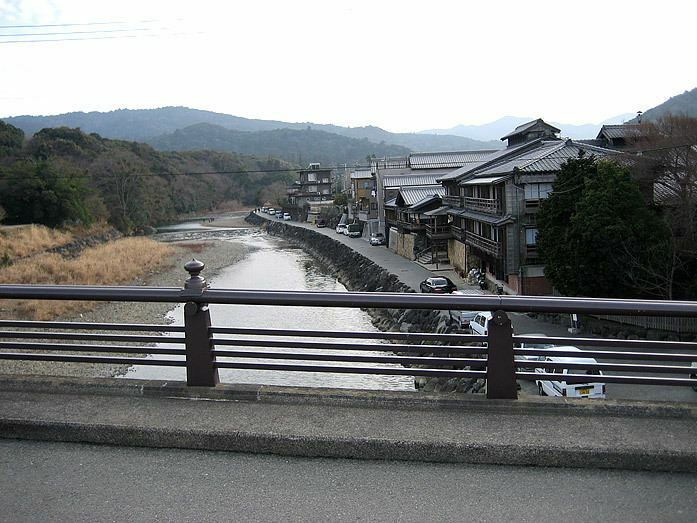 January 1, 1889: Uji and Yamada villages combined; Ujiyamada Village was established. September 1, 1906: Upgraded to city; Ujiyamada village became Ujiyamada City. October 12, 1909: First train line to Ujiyamada completed by JNR (Kokutetsu). December 20, 1930: Direct service to and from Ōsaka begins through Kintetsu. March 17, 1931: Ujiyamada Station opens. July 28, 1945: During World War II, 93 Twentieth Air Force B-29 bombers drop incendiaries, burning 39% of the city. November 20, 1946: Ise-Shima National Park is established. January 1, 1955: Ujiyamada City was renamed to Ise City and absorbed the villages of Toyohama, Kitahama, Shigō and Kida. The reason for this change is to avoid the naming confusion with the later-formed cities of Uji in Kyōto Prefecture and the city of Yamada (now the city of Kama) in Fukuoka Prefecture. 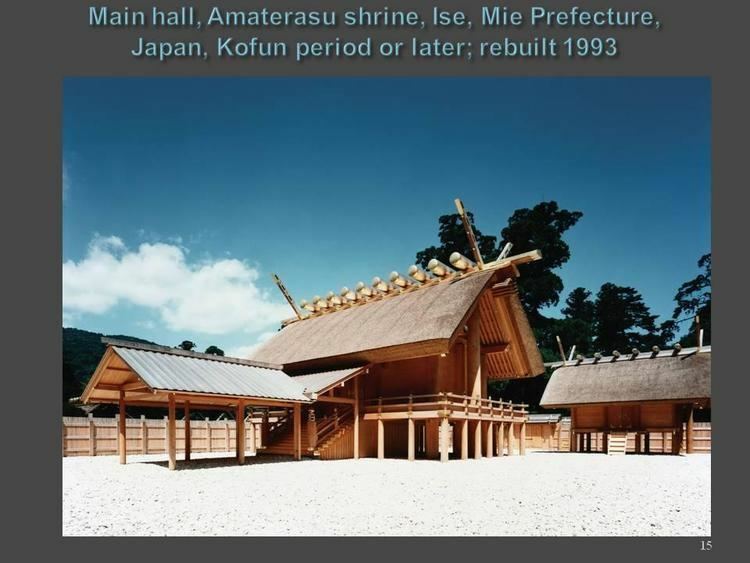 The name "Ise" was chosen because it was already recognized throughout Japan due to Ise Grand Shrine. September 26, 1959: The Ise-wan Typhoon, Japan's strongest-recorded typhoon, hits Ise and surrounding areas. November 1, 2005: Ise absorbed the towns of Futami and Obata, and the village of Misono (all from Watarai District) to create a new and expanded city of Ise. Akafuku: Mochi covered in sweet red bean paste. Ise Udon: Udon soaked in soy-based sauce. IseWashi: Washi (Japanese paper) for Ise Grand Shrine. Ise is easily accessible by rail due to the popularity of Ise Grand Shrine as a tourist attraction. Kintetsu offers direct service to Ise from Kyoto, Osaka and Nagoya in the form of regular express trains (once or twice an hour) and limited express trains (usually twice an hour). The ride from Osaka takes about 135 minutes (105 minutes on the limited express), the ride from Nagoya takes about 100 minutes (85 minutes on the limited express). JR Central, offers direct service to Ise from Nagoya once an hour on the Mie Rapid, which takes about 90 minutes. Sanco operates a number of buses to and through Ise. The main bus hub in town is in front of the JR exit of Iseshi Station. Sanco used to manage a tram service around Ise, in particular a line called the "Shinto Line" that ran from Iseshi Station to the Inner Shrine. It was closed in 1961 and replaced by buses. Ise has a direct ferry link to Central Japan International Airport. Ise Grand Shrine: It is sometimes called "The Shrine of the shrines" to indicate its status as the most sacred Shintō shrine. Legend has it that Yata no Kagami (The Sacred Mirror), one of the Three Sacred Treasures of Japan, is housed somewhere within the grounds. The entire Shrine is completely rebuilt from scratch every 20 years using fresh lumber that is brought to Ise and then ceremonially carried through the streets on its way to the Shrine during an okihiki (お木曳). The Shrine is in its 62nd reconstruction, meaning this tradition has been carried out for at least 1,240 years. The next reconstruction will be in 2033. Outer Shrine (外宮 gekū): Sometimes called toyouke-daijingū (豊受大神宮), it is dedicated to Toyouke-Ōmikami, the goddess of food, clothing, and shelter (life's basic needs). Pilgrims are supposed to visit the Outer Shrine before visiting the Inner Shrine. However, if the visitors time in Ise is limited they are encouraged to skip the Outer Shrine because the Inner Shrine is the far more famous of the two. Then again, this makes the Outer Shrine an ideal place for a tranquil walk through well-preserved nature as it is far less crowded. The beautiful pond that is immediately adjacent to the Shrine grounds is a particularly nice walk. The Outer Shrine is very close to Ise-shi Station. From the station, one should exit from the JR side (as opposed to the Kintetsu side), walk straight down the road, and arrive there within five minutes. Inner Shrine (内宮 naikū): Sometimes called kō-taijingū (皇大神宮), it is dedicated to Amaterasu-Ōmikami, the sun goddess who is sometimes called the "supreme kami." This shrine sees many visitors from around Japan on a daily basis; there is a sharp increase during the New Year's season. People traditionally visit a shrine on New Year's Day, but since it will be the first visit of a new year, special consideration is given to the choice of shrine. Some people travel to shrines that may be more significant than those in their own area, and this inevitably leads people to Ise Grand Shrine, particularly the Inner Shrine. The inner sanctum of the main shrine area within the Inner Shrine is off-limits to visitors, thus only the rooftop of the structure that houses the kami can be seen. This image widely represents Ise Grand Shrine. 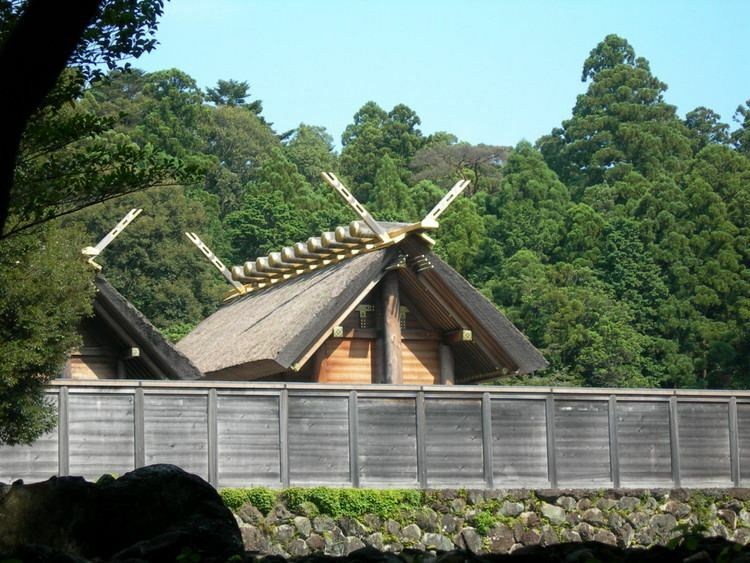 Cultural facilities: These institutions provide a deeper understanding of Ise Grand Shrine. They are all housed at the top Mt. Kurata which is part of the pilgrimage route between the Outer Shrine and the Inner Shrine. History Museum (神宮徴古館 jingū-chōkokan) chronicles the creation and development of the Shrine. Fine Art Museum (神宮美術館 jingū-bijutsukan) displays works by artists and painters donated during the reconstruction ceremony that is held once every 20 years. Agricultural Museum (神宮農業館 jingū-nōgyōkan): Since the Outer Shrine is dedicated to Toyouke-Ōmikami, the goddess of life's basic needs, this museum covers how agriculture fulfills these needs. Library (神宮文庫 jingū-bunko) contains various volumes dealing with Shintō and Ise Grand Shrine. Open to the public but generally used by researchers and Shintō priests. Oharai Machi (おはらい町): A small sidestreet that runs between Prefectural Route 32 and the entrance to the Inner Shrine with buildings that are made to look historical. The part of the road closer to the Inner Shrine is filled to the brim with vendors, particularly those selling omiyage. This road is home to the main akafuku shop. Okage Yoko-chō (おかげ横丁): This area branches off of Oharai Machi about halfway between Prefectural Route 32 and the entrance to the Inner Shrine. It has a large concentration of eateries. Taiko performances can be heard here sometimes, usually on the weekends. Both Oharai Machi and Okage Yoko-chō are extremely popular among tourists visiting the Inner Shrine and will often be just as crowded, if not more crowded, than the Shrine. The Wedded Rocks (夫婦岩, meoto-iwa): Located at Futami Okitama Shrine (二見興玉神社) in northeastern Ise. The rocks have been enshrined and are thus considered gods. The picture was taken at high tide. During low tide the sea is completely out and the rocks look less impressive. Visitors are encouraged to go during high tide. Ise-Shima Skyline: A 16.3 km-long scenic mountain road that runs between Ise and Toba. One-way with a car costs ¥1,220, with a motorcycle it's ¥860. Mt. Asama (朝熊山): At 555m, this is the tallest mountain in Ise; its two TV towers make it very distinctive. At the top there is a lookout point with a large paved parking lot that is accessible from the Ise-Shima Skyline road. Near the parking lot are some buildings and a pool of hot water to soak your feet in while you take in the beautiful view. The summit can also be reached by a hiking path up the mountain that starts just north of Asama Station. Kongōshō Temple (金剛證寺): A Buddhist temple near the top of Mt. Asama. It is accessible from the Ise-Shima Skyline road. Riverbank Park (宮川堤公園 miya-gawa tsutsumi kōen): A famous cherry blossom viewing area, making it a very popular destination during the prime blooming season which is in early April. Also has a big large fireworks display in mid-July. The park is on the east side of the river near the Watarai Bridge. Love River (ラブリバー) houses public leisure and sports facilities for baseball, soccer, basketball, and tennis. The park is on the east side of the river near Route 23. Edo Wonderland Ise (安土桃山文化村 azuchi momoyama bunka mura): A theme park with an Edo Period theme, featuring samurai, a ninja maze, and a ghost house. Located in Futami. Kawasaki: A lane of buildings built to resemble the old merchant quarters in Ise. Found along the Seta River north of Ujiyamada Station. Shintomiza (進富座): An independent movie theater showing a variety of art-house Japanese and foreign films. A short walk south of Miyamachi Station. Ise Festival: Ise's largest festival, held for two days in the mid-October. It celebrates all things Ise. Okihiki (お木曳): Festival in which the timber that will be used to reconstruct Ise Grand Shrine is ceremonially carried through the streets. Each neighborhood (or district) of Ise city is responsible for carrying its share of the load, and the ceremony is spread out over many weekends to allow all neighborhoods to participate. This festival is only held for the three consecutive years starting eight years before a Shrine reconstruction. For example, the Okihiki festivals for the next Shrine reconstruction in 2013 were held in 2005, 2006, and 2007. Okihiki for the Outer Shrine is held in May and starts on the Miya River. Okihiki for the Inner Shrine is held in late July and starts near the Isuzu River. Cherry Blossom Festival is held during cherry blossom blooming season on the Miya River (near the Watarai Bridge). Miya River Fireworks is held in mid-July. Tennō Festival is held usually on the Sunday evening of the three-day weekend in July, near Kawasaki. Well known for goldfish fireworks in the evening. Kon Ichikawa (1915–2008), film director. Hiroki Mizumoto (1985– ), soccer player. Has played for the Japan National Soccer team. Born in Ise (Misono). Mizuki Noguchi (1978– ), runner. Marathon gold medalist in the Athens 2004 Summer Olympics. Grew up in Ise. Eiji Sawamura (1917–1944), baseball player (pitcher). Member of the Japanese Baseball Hall-of-Fame. Born in Ise. Ōoka Tadasuke (1672–1752), samurai. Served as Chief of Police under the Shogun Yoshimune Tokugawa. Served as Magistrate of Yamada (modern-day Ise) in the Edo period. Isao Takahata (1935– ), director. Co-head of Studio Ghibli. Born in Ise.